Special prosecutors have requested a specific type of immunity for one of their witnesses and believe it will take less than a week to present their case against a trio of current and former Chicago police officers accused of trying to cover up the 2014 shooting of black teen Laquan McDonald. Special prosecutor Patricia Brown Holmes said during a brief hearing Thursday she expects it will take three or fewer days for her team to complete its case against Chicago police Officer Thomas Gaffney, ex-Officer Joseph Walsh and former Detective David March. The hearing marked the final scheduled court date before the case moves to trial later this month – nearly 1.5 years after the three were first charged in connection with the alleged cover-up. 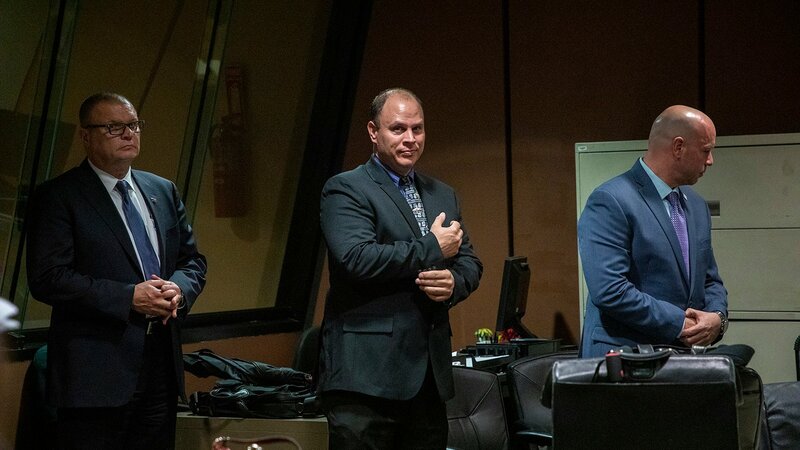 Walsh, Gaffney and March each face charges of conspiracy, official misconduct and obstruction of justice after they allegedly falsified official reports from the scene of the 2014 shooting to “conceal the true facts of the events” surrounding McDonald’s death in an attempt to shield Officer Jason Van Dyke from a criminal prosecution. Van Dyke was convicted early last month of second-degree murder and 16 counts of aggravated battery stemming from the fatal shooting. Brown Holmes has claimed the defendants submitted “virtually identical false information” about the shooting, each stating McDonald had used a knife to attack Van Dyke along with Walsh and Gaffney in an attempt to jusitfy the shooting. Police dashcam footage of the shooting shows McDonald did not attack Van Dyke or Walsh in the moments before he was shot. Brown Holmes on Thursday also asked Cook County Judge Domenica Stephenson to grant use immunity to Dora Fontaine, another CPD officer who was on the scene the night McDonald was killed, meaning her testimony cannot be used against her in any other criminal proceedings. The judge did not immediately rule on that request. Fontaine will likely be a key witness in the upcoming trial as she’s expected to testify that March instructed her to include false information in her incident report from the scene to incorrectly show Van Dyke was injured during his encounter with McDonald. Defense attorneys have painted Fontaine as a liar and say her testimony will contradict what she previously told a grand jury. She also testified as a state witness in Van Dyke’s murder trial, but made no mention of any alleged false information at that point. Thursday’s hearing served to clean up any housekeeping matters before the trial begins. Though prosecutors outlined their timeline, defense attorneys for the men did not say how long they expect their cases to last. But each defendant did reiterate their intent to seek a bench trial before Stephenson; as such, no jury will be selected and the judge will determine the verdict for each man. Van Dyke’s hearing lasted a month and included a week of jury selection. Prosecutors in that case also rested their case in under a week. As the conspiracy case heads to trial, defense attorneys had previously sought to bar expert testimony from a prosecution witness and exclude hearsay statements they say are prejudicial against their clients. Stephenson earlier this month denied those motions, as well as a request to toss out all charges against the men after defense attorneys accused Brown and her team of prosecutorial misconduct during previous grand jury hearings. The trial is scheduled to begin Nov. 26.